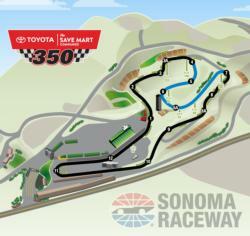 Sonoma Raceway will return to the circuit's historic 12-turn, 2.52-mile road-course layout for the 2019 Toyota/Save Mart 350 NASCAR weekend as part of its upcoming 50th anniversary celebration, raceway officials announced today. The full track layout, which was originally unveiled when the raceway opened in 1968, incorporates the raceway's signature sweeping downhill corner known as "The Carousel." The Carousel plunges from Turn 4, down through Turns 5 and 6 and navigates a more than 200-degree radius turn before dropping onto the raceway's longest straightaway into the Turn 7 hairpin. "The Carousel is a corner where history has been made, and as we celebrate the half century of track history in 2019, we are excited to re-introduce this signature turn on the Sonoma Raceway circuit," said Steve Page, Sonoma Raceway president & general manager. "We look forward to seeing a new generation of racers battle through this challenging corner and create moments fans will remember 50 years from now." The Carousel has been the site of many memorable moments in the raceway's history, including Dale Earnhardt's critical pass of Mark Martin in 1995 resulting in the Intimidator's first-ever NASCAR road-course victory. "Innovation and exceeding expectations is in the DNA of SMI. This is something fans and drivers have been talking about for years, and we are excited to bring it to them, particularly as part of the track's 50th anniversary," said Marcus Smith, CEO of Speedway Motorsports, Inc.
NASCAR utilized the full 12-turn course beginning with its first Pacific Coast Late Model Division race at then-Sears Point Raceway in 1969 through numerous Cup Series, West Series, Southwest Series and Truck Series events until 1997. Since 1998, NASCAR has competed on a shorter, 1.99-mile configuration, which utilized a bypass connecting Turns 4 and 7 known as "The Chute." 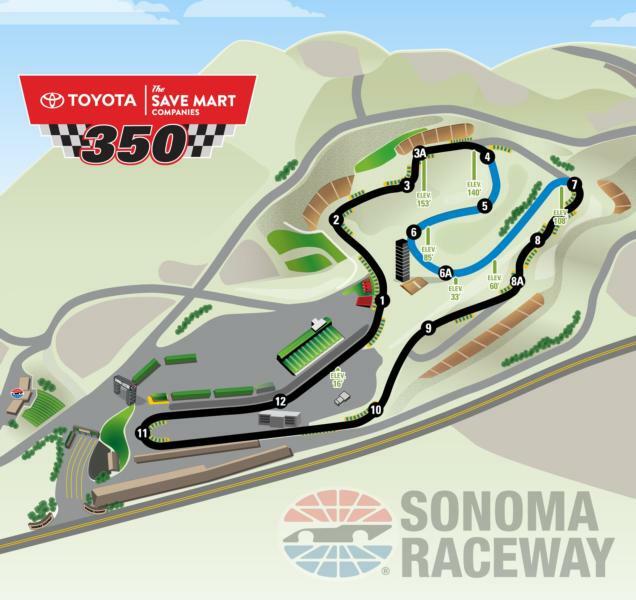 The 2019 Toyota/Save Mart 350 is expected to run 85 laps and the race distance will remain 350 kilometers. "The carousel adds a technical aspect to the track that will be a challenge for the drivers. I'm looking forward to the FOX broadcasts of the race weekend next year and analyzing how the teams deal with this new challenge," said Gordon, a five-time Sonoma winner.